Hello there! I have been eyeing lots of Reversible Knit Fabrics that Minerva offers on their site. I thought it would be fun to pair a reversible fabric with a tried and true pattern that I’ve made a few times. 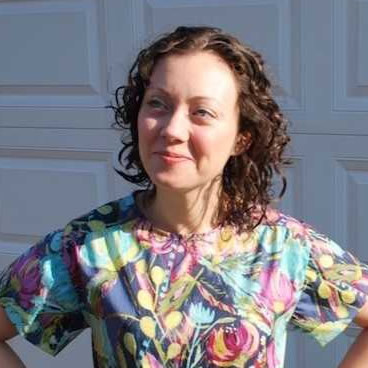 I’m calling this project a Reversible Pattern Hack with the popularAgnes Top by Tilly and the Buttons. I wanted to modify the garment construction to make it reversible, having two ways to wear the same top (worn either right side or “inside out”). The Agnes Top is a fun and versatile pattern. I find that the more classic garments get the most wear in my wardrobe. This top has become a TNT pattern for me and I’ve enjoined changing up the fabrics with various versions. The pattern includes multiple variations. For this project I picked a plain front with non-ruched, long sleeves. The fabric that I picked is a ubiquitous grey/black Reversible Ponte Knit. It’s a dual knit fabric (similar to an interlock knit) and both sides of the fabric can be the “right side” (versus one side being the right side and the other side being the wrong side of the fabric). I was really excited with this post to get really into the finishing details. I decided to use three machines for this project, a standard sewing machine, serger/overlocker and coverstitch machines. One disclaimer to share upfront, I am a maker for the Janome sewing machine Company. You do not have to have a serger or coverstitch machine to recreate this project. I enjoyed exploring and using all three machines for this project. You could absolutely re-create this project with only a standard sewing machine. In case you’re curious, the machines that I used for the project are the following (the machine names are linked below, for reference). The Skyline S7 and the Air Thread 2000D are two machines that I received from Janome for use this year (I selected the machines for use). The coverstitch machine, CoverPro 900CPX is one that I purchased. As I’ve made a few versions of this pattern, I thought I’d share a picture of one that I’ve made. I used a thicker interlock type fabric for this version as well. I included the ruching detail in the front and selected the half sleeve option. In order to have a garment that can be worn reversible, I wanted to spend time exploring how to change the construction of the seams. I first cut out the fabric pattern pieces and then utilized the leftover fabric scraps to test seam options. Spending time upfront with the experimentation of the seams saved me a lot of time, in the end. Once I decided how to construct seams and adjusted the different sewing machine tensions up front, I was able to more quickly (in the end) sew up the top. The first idea seam idea that I wanted to try was flat lock seams with the Serger/overlocker. You see this seam frequently in commercial, athletic garments. I’ve found it helpful to use different colored threads when testing with fabric swatches. It is very helpful to easily see which threads are off tension and then make the adjustments needed more quickly. I first tried the three thread, flatlock seam. I walked through the suggested tensions and settings from the manual and experimented more from there. I then switched to a two thread, flatlock seam to experiment some more. In the end, I wasn’t happy with the seams in the swatches and an idea dawned on me. I switched fabrics to test a lightweight jersey scrap from my stash. I found that the thinner jersey knit fabric worked much better for the flatlock seam application. I realized that a lot of the athletic wear fabrics that I’ve seen in commercial garments are a thinner material. I’m sure there are other ways to go about making flat seams with this material but I decided to abandon this seam method and come back to flatlock seams in a future project (with a thinner weight knit fabric). My next step is to think about how to a different approach to sew a reversible seam. I decided to serge the edges of the seams and then sew this seam flat. I tested the serger thread tensions with a swatch. I serged the edges with the grey fabric as the “right side” (but there technically isn’t a wrong side to this garment). For the serged seams, I decided to use wooly nylon thread for the upper looper. It offers a flexible and less bulky option then standard poly thread. With this fabric being more of a medium weight density, I wanted to be careful about the seams being too bulky. I then sewed this serged seam flat. I selected a grey thread in the sewing machine needle and black thread in the bobbin. Sewing with the grey fabric on top, I used a lightning bolt stitch for a bit of stretch and sewed the serged seam flat, underneath. To sew the seam flat, I used the standard sewing machine. I used a Dual Feed foot that came with the standard sewing machine. I also adjusted the Dual feed balancing dial to a -3 for the fabric. The following is the lightening bolt stitch that I typically like to use when sewing knits on a standard machine (stitch number 6 in the photo). You could also use a zig zag stitch for this step. The result help the serged seam lay flat. The bobbin thread is invisible on the black side of the fabric and the grey thread looks like a standard seam. I wanted to think about a different way to approach the hems of the garment. I knew I wouldn’t like the bulkier look of traditional hems worn with the “wrong side out.” I decided to sew faux hems. I left the edges of the bottom and the sleeve hems raw and used the coverstitch machine to sew around the edges, at a 0.75” (2 cm) edge. The result looks like a traditional hem but it is a decorative and reversible option. I decided to self-draft the neckband. I didn’t use the neckband pattern but instead measured the neckline and cut out a neckband at a length 10% smaller. I really appreciated the construction details included in the pattern (the neckband percentage details are included in the pattern instructions). I had a different neckband construction in mind. The pattern calls for a folded, traditional T-shirt style neckband. I had previously seen a commercial neckband construction that I’ve been wanting to recreate (Yes, I’m one of those weird gals that studies garments in department stores to research construction details). The neckband edges in the commercial garment were raw, giving a textured edge finish. I thought this was a fun look and I decided to utilize this technique for this project. To experiment recreating this look, I cut out two pieces of fabric (to practice this idea with fabric scraps). I sewed each of the two neckband pieces onto the “neckline scrap”, one at a time. I layed the grey fabric neckband edge against the top grey fabric edge. I sewed this seam with the standard sewing machine with a 0.25” (0.6 cm) seam allowance. I then repeated these steps for the other side of the fabric (and then folded both edges up together). I then wanted to add a coverstitched seam along the neckline to give a nice, reversible finish. The coverstitch machine that I used has a switch for the underside tension to go between either a woven or a knit fabric. I found in this example, because the fabric was heavier and more stable (sewing four layers of fabric for this seam), the knit setting was too loose and the woven setting was just right, tension wise. For reference in the photos below, the knit setting is shown on the left and the woven setting is on the right. I used grey thread for the needle stitches and black thread for the back looper stitches (for a reversible finish). I decided to cut down the neckband width to 0.75” (2 cm) to match the neckband width suggested in the pattern. The following photos show both side of the fabric scraps with the neckband, the grey tone first and the black tone in the second photo. Size: I picked a size 5 for the sleeves and upper top and a size 6 for the waist/hips. Length: This top was the first version that I’ve made of the long sleeved top. I lengthed the sleeve pattern by 0.25” (keeping in mind that I did not sew traditional folded hems). Sleeve seams: For the top shoulder seams, I sewed these seams flat before I sewed up the under arm seams. The underarm and side seams however were a little more challenging to sew flat. For the side seams in the body, I was able to sew these seams flat from the underarm to the bottom hems. For the sleeves, I started at the underarm and sewed the side seams flat on each side to about halfway down the sleeve (note the thread tails in the photo below for where I stopped sewing on the sewing machine). The under arms were more challenging because when you hit a certain place in the tube of the sleeve, the circumference was too challenging to sew on the machine. After stopping on the sewing machine, I hand sewed the rest of the underarm seams flat. One negative to hand sewing is that you could potentially see the thread as you are sewing with it (and I was wanting to keep it hidden for the reversible option). That is one benefit to the machine sewing, with thread on the top and the bottom of the seam you can use two different colored threads, to hide them. I decided to use gray thread for the hand sewing in the under arm and I hid the thread underneath the serged seam. That way the little tack of stitches that you see on the gray side of the fabric, this thread is visible and blends in. Hiding this thread underneath the serged seam then on the black side of the fabric helps so that you don’t see the gray thread. In areas that I had thread tails (coverstitched hems, hand sewing, etc.) I carefully hid the tails within the seams with a hand sewing needle. These steps took a little more time then normal, but I loved the idea of keeping this garment seamless and fully reversible. One area that I did not execute well are the back seams of the neckband. I serged the edges of the neckband tube seams and then sewed them flat before applying the neckbands onto the shirt. I aligned these two back seams together but I realized later that I should have staggered these two seams. The result (with aligning the two back seams) was the area became too bulky and was too challenging to sew with a coverstitch machine. A way that I worked around this issue was to start the coverstitch seam after the back seam. Coming around the neckline, I stopped this seam before the back seam. The result had this back seam area left open. I then hand stitched the open, two back seams together so that they would remain flat (with a mattress stitch). I then hid the tails of the coverstitched threads from the neckband in between the sandwiched neckband seams. I had three sets of tail ends that I pulled in between the seam and closely trimmed these threads in between the seam (to hide them). There is one fit area that I regret with this top. I did not study my previous muslin well before cutting out this top. I found with this project, the shoulder seams are too low for a “proper” fit. Having said that I will wear this shirt and will still enjoy wearing it. It’s not one of those things that bugs me enough to not wear the shirt. I would say this more as a note to myself that if I make the top again, I need to grade across three sizes (going down a size at the shoulders) rather than grading across just two (to improve the shoulder seam fit next time). I did want to share a humorous thought with this project that will be a bit of an experiment for me. I don’t know about you but garments that I wear in the summer can tend to have armpit stains from deodorant and normal wear. That said, this shirt will be worn mostly in the fall and winter due to its thickness and warmth. Typical garments are not worn inside out. Both colors in this fabric are dark so white deodorant showing on the fabric would be a negative. This deodorant element will be a bit of an experiment for me to see how well it works to wear a reversible garment. Time will tell but I am looking forward to having two options of shirts with this top, especially for travel wear. I really enjoyed this project! It’s made me want to try more reversible hacks to other top garments as well. I wish you all a very exciting time with your own handmade, reversible garments!